If we can send a spaceship to a distant comet, is it so strange to wonder of other civilizations out there are trying reach us? Of course it's strange! That's what makes UFO reports so interesting and so much fun to read. 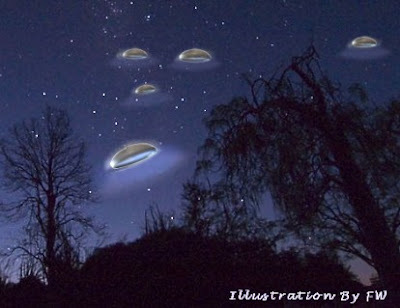 The National UFO Reporting Center (www.nuforc.org) collects sightings of unidentified objects and sorts them by shape, date and helpfully for our purposes, state. We've, tabulated the totals for the District, Virginia and Maryland in 2014. . ..
Accounts of Large UFO Reported in Eastern United States! Magazine Editor Explores UFOs in Washington D.C.
Labels: 2014 , Maryland , National UFO Reporting Center , NUFORC , Peter Davenport , Sightings Data , UFO , UFOs , Virginia , Washington D.C.